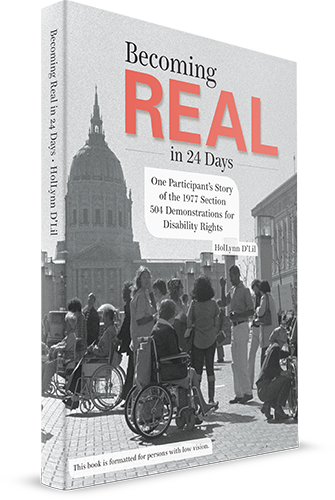 A disability-rights advocate for the last forty years, HolLynn D’Lil has played a major role in shaping California accessibility standards, including the first California Building Code standards for accessible public accommodations, historical buildings and housing. National Fire Protection Association, the California Division of the State Architect, the Secretary of State, the California Department of Housing and Community Development, the State Historical Building Safety Board and the State Fire Marshall. Her publications include articles in Ms. Magazine, Mainstream Magazine, the Los Angeles Times, the San Francisco Examiner, the Santa Rosa Press Democrat and the Orange County Architect. She wrote the California Access Guide: Survey Checklist; an information bulletin for the National Center for a Barrier Free Environment; and a chapter in The Whole World’s Watching, by Berkeley Art Center Association. Awards include Advocate of the Year from the California Coalition of Independent Living Centers; Extraordinary Meritorious Services Award from the Sacramento Area Mayor’s Committee on Disability Issues; Outstanding Woman Entrepreneur from the California Governor’s Conference on Women in Business; Best and Brightest from Sacramento Magazine; Award for Outstanding Contribution to the Image of Sacramento Women, Sacramento YWCA; and first place for Architectural Planning and Design of a Customized Single Family Residence from the California Governor’s Committee for Employment of People with Disabilities. Currently, she is the president of the Graton Green Group, and was elected to the board of directors of the Graton Community Services District. She is a member of the board of Designing Accessible Communities. Click here to read HolLynn's originally proposed bio!